By the end of the 17th century, Portsmouth had developed as the chief naval base in Britain. Daniel Defoe wrote around 1720 that Portsmouth had "the best security for any navy above all the places in Britain". From about 1750, the yard was kept busy supplying vessels for military campaigns. After a spectacular fire in 1760 that destroyed many of the original wooden structures along the harbour, dockyard buildings began to be built of brick and many such buildings survive from this period. 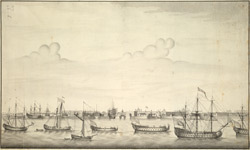 This is the original drawing of a view later engraved by PC Canot, used at the start of Milton's 1754 dockyard plan.